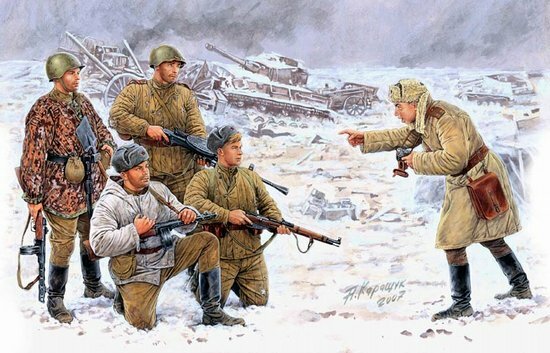 In the course of battle, especially battles as hard as the fighting in the Korsun-Shevchenkovskiy pocket, supply officers did not always manage to deliver the required equipment and uniforms on time. For frontline soldiers on both sides, this meant scrounging necessities where they could be found. Both Russian and German soldiers wore captured clothing more often than not. Russian soldiers pointed out the excellent concealment given by the German camouflage jackets, while they rightly assumed that their cold-weather gear was better suited than the Germansâ€™ to the harshness of the Russian winter.